The grim fact was unrelenting rain, this trip to Portugal. There wasn’t even a gasp of sun in our nine days, but despite the gray, my memories are about color, texture, and an unstudied but penetrating aesthetic confidence that permeates the country. In a typical self-deprecating analysis of his home, one young man gave us the country’s one-liner history lesson: “We peaked in 1500, and it’s been downhill ever since.”We heard a lot of these jokes, but soon came to realize that under it all, the Portuguese are very proud of this place, and feel no need to defend it or compare it to Spain or Italy. The art, architectural and cultural treasures of Lisbon and Porto–whether 16th century Manueline, 21st century modern, or anything in between–are extremely sophisticated and are best analyzed on their own significant terms. All aspects of traveling in this country were perfect for us: the people, the food, the adventure/comfort balance, the unplanned and accidental moments. But now, looking back at the thousand or so photos taken that week, it’s clear that the places we stayed were what captured us. 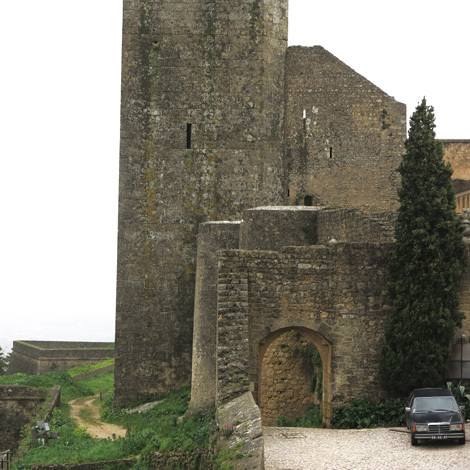 We took advantage of the pousada system, a network of hotels in old castles, convents, monasteries and other ancient buildings, and each one was more spectacular than the previous. Our last couple of nights were at the Palacio Belmonte, a castle with Roman, Visigoth, Moorish and Modern components, now owned by an eccentric, warm and fascinating couple who were ready to talk politics, art, food or anything in between. They darted in and out of the shadows of the castle, but really, we had the place to ourselves. Smoky fires smouldered in multiple fireplaces, Scarlatti drifted through the air, and we sat and read in each of the public rooms, between drenching walks outside. At first, walking in Porto and Lisbon, one is reminded of many other grand old European cities, a bit down on their heels. But then, all of a sudden, there will be a glimpse of something so extravagant and beautiful that it takes your breath away. And then, those tiles! In the midst of gray stone, gray streets, and gray skies, again and again we came upon the brilliance of a blue and white tile facade, or arcade, or alcove. . . . . . .